Thursday November 25th 1926 There was a heavy fog all day. Cora took Hattie and me over to Otts about 10.30. Fannie had such an excellent dinner and we had a good days visit. Cora brought us home just at dark. difficult driving. Friday November 26th 1926 I helped Hattie knot a couple of comforts. It snowed all forenoon after raining in the night. I had a letter from Winnie. I read in evening and listened to Radio. Lost the set out of Wills [moms?] agate ring but found it on the floor. Saturday November 27th 1926 I threaded beads and began a bag that I worked at most of the day. Hattie finished her comforts. We listened in to the foot ball game at Chicago between The Army & Navy which was a tie. Cora down town with Rob in PM. 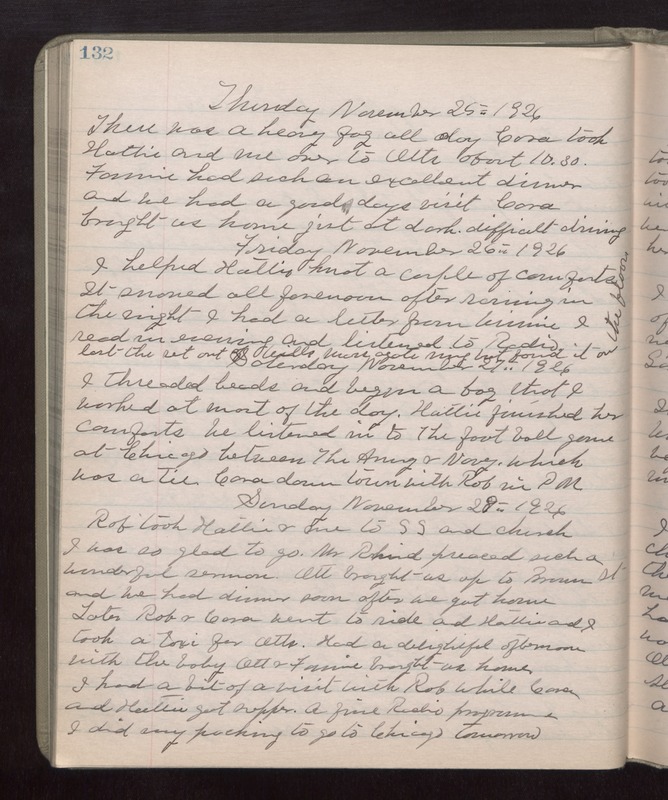 Sunday November 29th 1926 Rob took Hattie & me to S S and church. I was so glad to go. Mr Rhind preached such a wonderful sermon. Ott brought us up to Brown [st?] and we had dinner soon after we got home. Later Rob & Cora went to ride and Hattie and I took a taxi for Otts. Had a delightful afternoon with the baby. Ott & Fannie brought us home. I had a bit of a visit with Rob while Cora and Hattie got supper. A fine Radio programme. I did my packing to go to Chicago tomorrow.